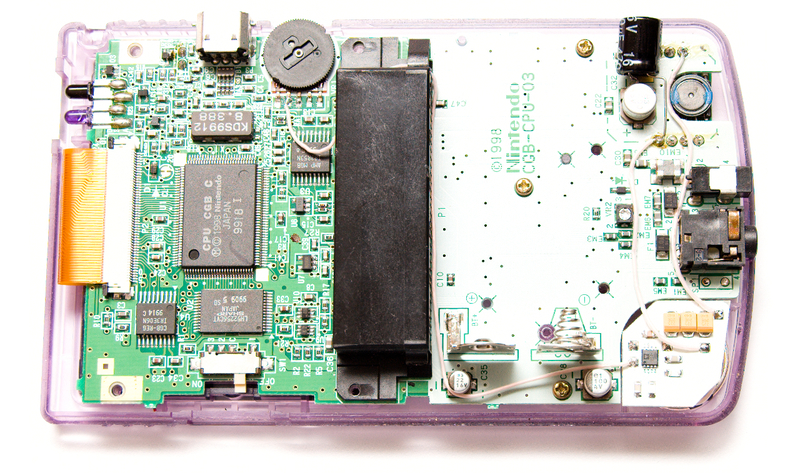 This is a "Hi-Fi" Class D amplifier for Gameboy Color internal speaker. I've got GBC and found rusted speaker with crackling noisy sound and it was barely hearable. Headphones is not the way out. 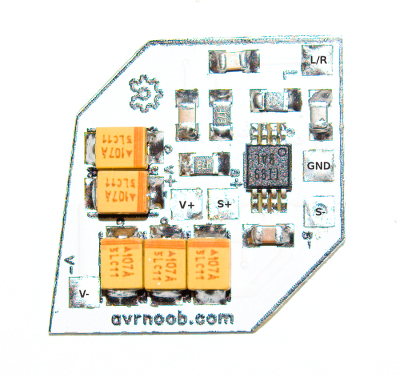 For the next version I selected other Class D amp from Analog Devices, it's even smaller. I pick smaller one so I can make pcb which fits in the speaker cutout in GBC, just on top of the speaker. In this one I used TI Class D amplifier ic again. Also mixing stereo signal to the speaker. Main benefit is the sound volume, it's much louder than integrated amp, and takes no space inside. Class D amp is very power efficient, this means longer battery life, significantly longer. If you add additional capacitor on the power line you can get cleaner sound than stock (using line out connection). But with GBAmp 2s version you probably not need for additional capacitor, there are plenty fit on the pcb. You need basic soldering skills to solder 7 wires. I will provide detailed step by step tutorial. GBAmp2s pcb is an Open Source Hardware. WARNING If you connect PCB polarity wrong you will fry the amplifier IC, so be carefull. 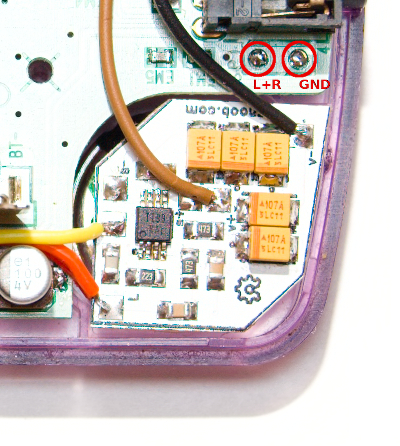 5 presoldered wires to the PCB (optional, wires colors does not matter a thing). 2. 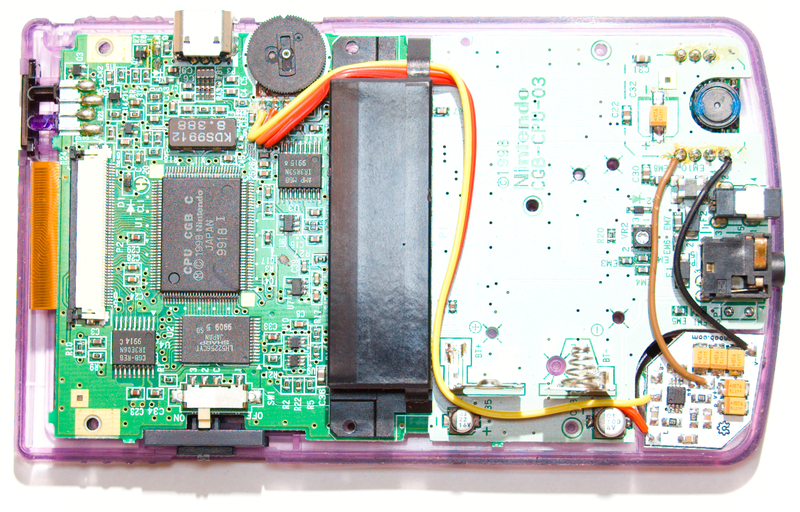 Unscrew and open your Gameboy Color. Do not forget to remove batteries when you open the case. 4. 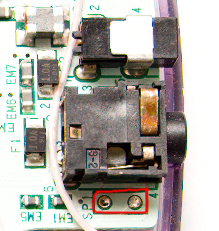 If you leave original speaker then take red wire from the speaker and solder it wire to S+ pad on GBAmp2s pcb. Then take black wire and solder it to S- pad. Solder wires from the back of pcb because speaker will go under GBAmp2s pcb. 5. Solder wires as shown on the next picture. 7. Put speaker in the speaker cutout and push pcb over it. 8. Install back cover. Make sure V+ and V- connected corrctly before turning it on. Enjoy your new sound. Optional. 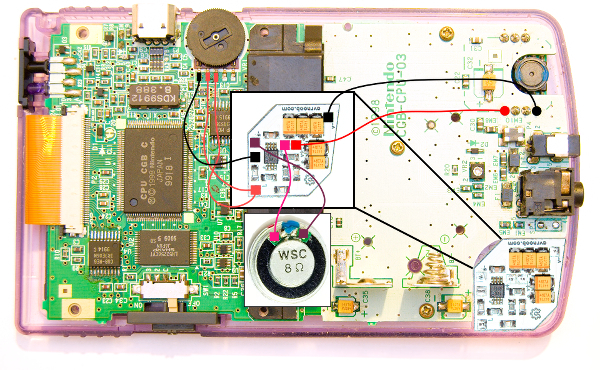 If you need GBC to switch off speaker when you plug in headphones jack, then you need to connect 3 wires (GND, L, R) to another place. There will be more speaker noise if you use this connection though, due to LCD noise coupling to gameboy amp chip. See next picture for details. If you want to install GBAmp mod pcb into DMG-001 classic console, then solder wires as shown on the next pictures. Desolder original wires from the speaker and DMG pcb first. I've updated wires diagram and power wire has new connection. It should help if your DMG shutdowns on high volume. I have not updated installed wires picture though. If you have a little distorted but loud sound on not max volume settings then swap speaker wires. If you have the same after swapping, then probably volume control is rusty. If you do not have sound check all connections and wires. If you have very low volume and heavy distorted sound then amp is probably dead. Or speaker is dead, check with another speaker. © 2014 Anton Veretenenko. 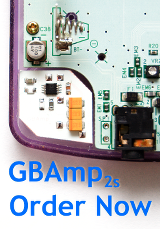 GBAmp2 is Open Source Hardware, CC-BY-NC-SA License.